Citing “new technologies” and “economic realities,” the Times Herald-Record in Middletown, N.Y., laid off its four remaining staff photographers earlier this month, joining the growing ranks of newspapers that are shrinking or eliminating their photography staffs. Along with their newsroom colleagues, news photographers have not been immune to the layoffs affecting the newspaper industry. But a landmark moment occurred this past May, when the Chicago Sun-Times axed its entire 28-person photography department. Another major U.S. daily, The Atlanta Journal Constitution, announced in October that it would lay off a significant number of its staff photographers. 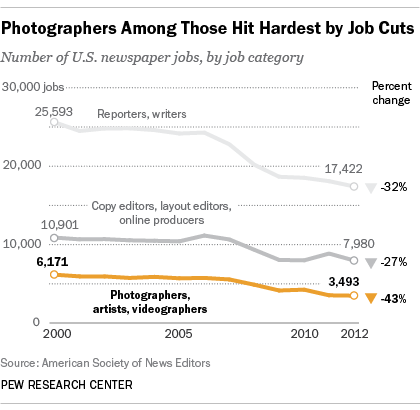 Indeed, the annual newsroom census from the American Society of News Editors indicates that photographers, along with other visual journalists, represent the category of newsroom staffers hit hardest by the numerous rounds of job cuts. The ranks of photographers, artists and videographers have been trimmed by nearly half (43%)—from 6,171 in 2000 to 3,493 in 2012, according to ASNE. By comparison, the number of full-time newspaper reporters and writers dropped by 32%—from 25,593 to 17,422. In the same period, 27% of copy and layout editor and online producer jobs were lost, falling from 10,901 to 7,980. Data from the last three years alone further highlight this job insecurity. From 2010 through 2012, ASNE recorded an 18% reduction in full-time photographers, artists and videographers. That compares with a negligible job loss (0.2%) among copy and layout editors and online producers. And it is three times the rate at which reporters and writers lost their jobs (6%). A number of factors seem to be responsible for this high rate of attrition among photographers. Shrinking newsroom budgets play a significant part, but so does the explosion of mobile technology and social media, making it easier for citizens and non-professionals to capture and share images. When it laid off several photographers in 2011, CNN cited the “impact of user-generated content and social media…in breaking news,” as a key reason. Donald Winslow, an official with the National Press Photographers Association, suggested another factor behind the cuts. In some cases, he said, the victims were veteran photographers pulling down relatively high salaries, making them tempting targets when newspaper organizations are looking to cut costs.